Last week started off slowly for new option positions, but by the end of the week there ended up being 16 new positions put on and 3 existing positions that were rolled out in time. New positions ended up being quite plentiful, but closing positions were a bit lighter than I'd have liked. I'm hoping this week will provide some opportunities to take off some positions and lock in profits while taking risk off the table. So far the ~1.5% dip about 1.5 weeks ago is all we've seen in the way of a two sided market. In my view valuations are still stretched, but market participants don't seem to care too much. I'm not about to go and short the market; however, I will take a few small bearish bets. One of the things I like about the call credit spread is that you can even have the underlying go against you and still turn a profit as long as it doesn't go too far against you. That's a huge plus with using options; you can make money if you're right and even if you're just partially wrong. The max potential profit on this trade is the $29.71 credit received on order entry. The capital at risk is the $1.00 width of the spread less the credit received or $70.29. If DIA is trading below $211 at expiration then I'll realize the maximum profit on this trade. The $29.71 profit would be a solid 42.3% return on the capital at risk. If DIA is trading above $212 at expiration then I'll realize the maximum loss on this position. Since having a small decline about 1.5 weeks ago the markets have headed higher and in turn the VIX has headed back lower and is now back down to near all-time lows. Sticking with my bearish thesis on the markets I'm taking a directional shot on UVXY which should increase if the markets have any kind of down move. This was a debit spread rather than my preferred credit spread strategy. The most I can potentially lose on this position is the debit paid to enter the position or $156.34. 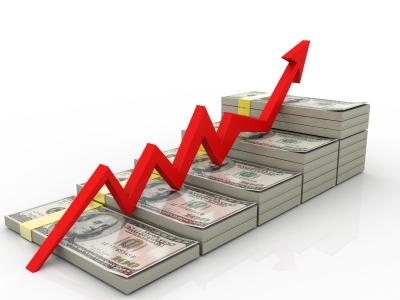 The maximum potential profit is the $9.50 width of the spread less the debit paid or $793.66. If UVXY is trading above $19.50 at expiration then I will realize the maximum possible profit on this position. The $793.66 would be a huge 407.7% return on capital. 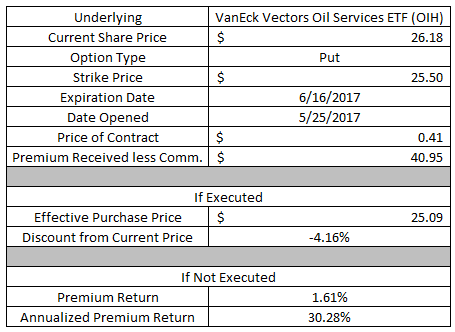 If UVXY is trading below $10 at expiration then both options would be OTM and be worth $0. I would realize the maximum possible loss on this position. I don't have a specific target in mind for closing this position. However, if we get a pop in volatility in a relatively short time I will likely aim to close the position for a net credit around $250-300 which would be a $100-150 profit. My overall thesis on the markets is that they're due for a pullback, of course I've been thinking that for nearly 6 months now and it hasn't really materialized. Since I have several bearish positions on against DIA and SPY I decided to go with a neutral position against the broader market Russell 2000 ETF, IWM. The maximum possible profit on this position is the credit received at order entry or $54.42. The maximum possible loss is the largest spread width, $2.00, less the credit received or $145.58. As long as IWM is trading between the two short strikes, $130 and $144, at expiration then I will realize the maximum profit on this trade. The $54.42 profit would be a 37% return on the capital at risk on this position. If IWM is trading below the $128 strike of the long put or above the $146 strike of the long call at expiration then I will realize the maximum loss on this position. My plan for this position is that IWM will remain between the two short strikes and as time passes it would eat away at the price of the options. My target is to close the position at 50% of the credit received. I like to mix up my strategies by both duration and the underlying thesis. By doing so that should help to smooth out the profit/loss over time. 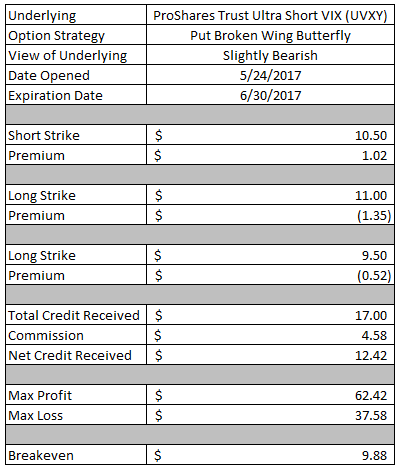 So I went with an iron condor in the July expiration cycle on SPY. The maximum profit I can make on this position is $50.42. The maximum possible loss is the $2.00 width of the spread less the credit received or $149.58. If SPY is trading between $229 and $246 at expiration then I will realize the maximum profit on the position. The $50.42 profit would be a 33.7% return on the capital at risk. If SPY is trading below $227 or higher than $248 then I will realize the maximum loss on this position. My target is to close the position early to lock in a profit around 50% of the credit received. Even though I have a bearish leaning on the markets as a whole I still want to have bullish positions on as well. Shares of Pandora have been beat up badly and there's rumors that they could potentially be acquired. With the beat up share price and potential bullish catalyst I wanted to take a conservative bullish bet on Pandora. The maximum profit I can make on this trade is the $30.71 credit received at order entry. The capital at risk on this trade is $69.29. If Pandora is trading above $8.50 at expiration then I'll realize the maximum profit on this trade. The $30.71 profit would be a 44.3% return on the capital at risk. If Pandora is trading below $7.50 then I'll realize the maximum loss on this position. My target is to close this position at 50% of the credit received. Foreign markets are generally trading at better valuations and therefore have more room to the upside should good news come out. The max potential profit on this trade is the $52.71 credit received at order entry. The max possible loss is $147.29. If EFA is trading above $65 at expiration then I'll realize the max profit on this position. The $52.71 profit would be a 35.8% return on the capital at risk. If EFA is trading below $63 at expiration then I'll realize the max loss on this position. While I'm not a fan of gold as a long term investment I do still see opportunities in the sector to generate investment returns. The max potential profit on this trade is the $49 credit received at order entry. The capital at risk on this position is $2,200. If GDX is trading above $22 at expiration then I'll receive the max profit on this trade. The $49 profit would be a 2.23% return on capital and would generate a 25.0% annualized return. 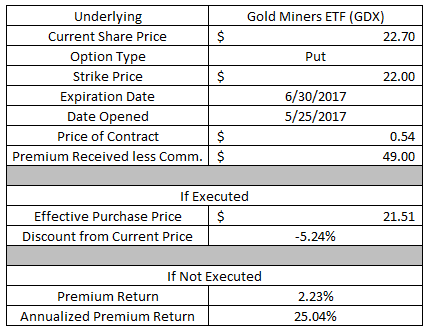 If GDX is trading below $22 at expiration then I'll have to purchase 100 shares of the ETF at an effective purchase price of $21.51. My adjusted cost basis would be at a 5.25 discount from where the shares are currently trading. The max potential profit on this put option is the $79.95 credit received at order entry with $2,850 capital at risk. If Micron is trading above $28.50 at expiration then I will realize the max profit on this trade. The $79.95 in profit would be a 2.81% on the $2,850 capital at risk with an equivalent annualized return of 41.7%. 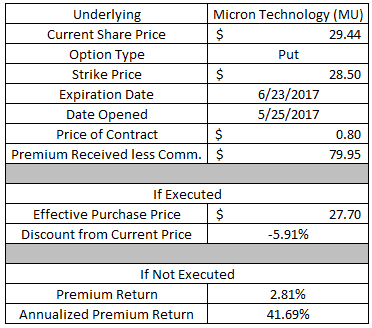 If Micron is trading below $28.50 at expiration then I'll have to purchase 100 shares of Micron at an adjusted cost basis of $27.70. That would be a 5.9% discount to where Micron's shares were trading at the time the position was opened. If the shares are put to me then I will aggressively sell call options against the shares to have them called away. Surprisingly enough the financial sector hasn't really participated in the markets' rally over the last month or so. In general I think Bank of America is still the best value among the TBTF banks and should do well over the coming years especially if the Fed is able to continue with their interest rate increase program. The capital at risk on this trade is the debit I paid to open the position of $77.29. The maximum potential profit on this trade is the $2.00 width of the spread less the debit paid or $122.71. If Bank of America is trading above $25 at expiration then I will realize the maximum profit on this position. That would work out to a 58.9% return on capital. If Bank of America is trading below $23 at expiration then both contracts would be OTM and I would realize the max loss on this trade. Last week OPEC announced they would be extending the production cuts for an additional 9 months in hopes of curbing the supply glut that is plaguing the oil field. I guess it was a "buy rumor, sell the news" situation because the price of oil sold off on the news bringing just about every oil related equity down. If OIH is trading above $25.50 at expiration then the contract would be OTM and I would keep the full option premium as profit. The $40.95 option premium received at order entry would be a 1.61% return on the $2,550 capital securing the contract. Throughe expiration that would equate to a 30.3% annualized return. If OIH is trading below $25.50 then I will have to buy 100 shares of the ETF at an adjusted cost basis of $25.09. My cost basis would be around a 4.2% discount from the price that OIH was trading at the time the position was opened. Amazon has been on quite a tear and is now pushing up on the $1,000 per share mark. Earlier last week I put on a similar position to this one and took it off later that same day and my plan with this one is to scalp some small profits as well. The maximum profit potential on this position is the $75.69 credit received at order entry. The capital at risk is the $2.50 width of the spread less the credit received or $174.31. 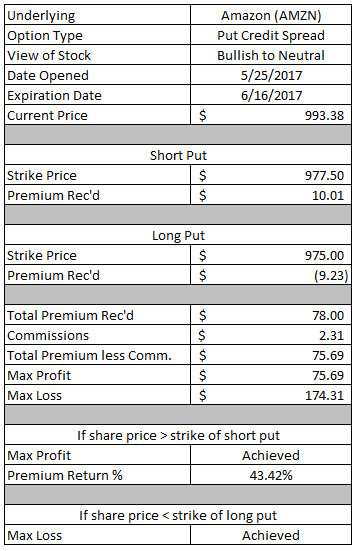 If Amazon is trading above $977.50 at expiration then I will realize the max profit on this position. The $75.69 profit would be a 43.4% return on the capital at risk. If Amazon is trading below $975 at expiration then I will realize the max loss on this position. My target is to close this position between 25-50% of the credit received. While I love the drive and vision of Elon Musk, I just don't understand the love for the company's stock given the fact that they are burning through cash at a fast clip. I already had a bullish put credit spread position on and with the move higher last week I decided to put on defined risk bearish position. Looking at the 2 positions together it's almost a calendarized iron condor. The max profit I can make on this trade is the $82.70 credit received at order entry. The capital at risk on this position is the $2.50 width of the spread less the credit received or $167.30. If Tesla is trading below $332.50 at expiration then I will realize the max profit on this position. The $82.70 profit would be a 49.4% return on capital. If Tesla is trading above $335.00 at expiration then I will realize the max loss on this trade. With only ~3 weeks until expiration I'll likely be quite aggressive with closing this position. Most of the time my initial target is to lock in 50% of the max profit; however, I'll settle for a 15-25% profit if I can do so quickly to avoid having the other option greeks take over the position. Volatility, especially in the form of futures ETFs like UVXY, is a decaying product. As such the continuous cost to roll the contracts leads to a falling share price of the underlying and reverse splits. While my overall thoughts are volatility should be higher I decided to add on a position that could take advantage of a further decline in volatility and the decay of UVXY. Enter the put broken wing butterfly. At order entry I received a net credit of $12.42. The max potential profit on this position is $62.42 with a maximum possible loss of $37.58. If UVXY is trading above $11 at expiration then all of the contracts would be OTM and I would just keep the credit received as profit. If UVXY is trading at $10.50 at expiration then I will realize the max profit on this trade. If UVXY is trading below $9.50 at expiration then I will realize the max loss on this trade. I think this is a good set up given the low volatility environment that the markets are currently in. If volatility increases, as I expect it to, then this trade would provide a decent return on capital around 33%. If the low volatility environment continues then time and the natural decay in UVXY will bring the price of UVXY down which could potentially allow me to close this trade at max profit. If it moves too far down then I would realize the max loss on the position; however, VIX is currently at near all-time low levels so there's somewhat of a natural stop on the underlying's price. After freeing up a good chunk of capital in my rollover IRA I wanted to get back to putting some capital back to work via my preferred option strategy of selling covered calls or writing cash secured puts. 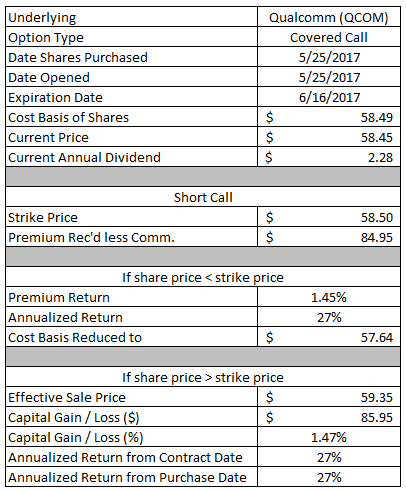 Union Pacific had an ex-dividend date on May 26th so I purchased 100 shares while simultaneously selling a call against those shares via a buy-write. 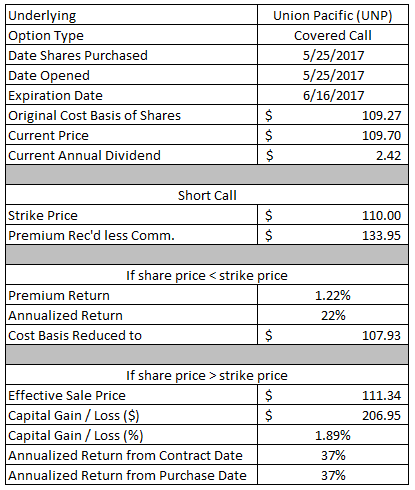 I purchased 100 shares of Union Pacific for $109.27 per share and sold the Jun 2017 $110 call option and collected $133.95 in option premium. If Union Pacific is trading above $110 at expiration then I'll have to sell my 100 shares at an adjusted sale price of $111.34. That would be a solid 1.89% return in about 3 weeks' time or 37% annualized. Since I purchased the shares prior to the ex-div date I'll also be entitled to the next dividend payment of $0.605 per share. If Union Pacific is trading below $110 at expiration then I'll get to keep the shares and use the option premium to reduce my cost basis and also still be entitled to the next dividend payment. If this happens then my adjusted cost basis on these shares would be $107.93. 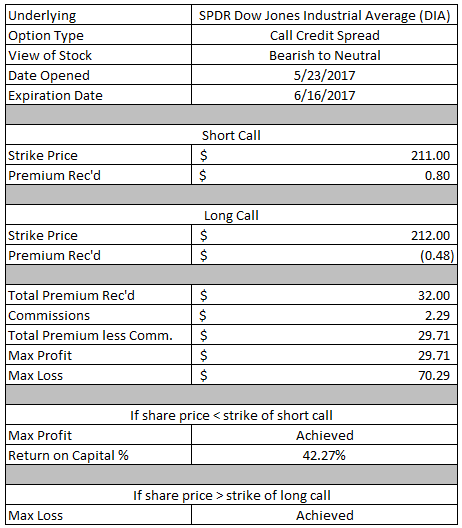 The option premium would represent a 1.22% return based on the $110 strike of the call option. Similar to Union Pacific, Qualcomm also had an ex-div date of May 26th so I decided it would be a good fit for a buy-write. 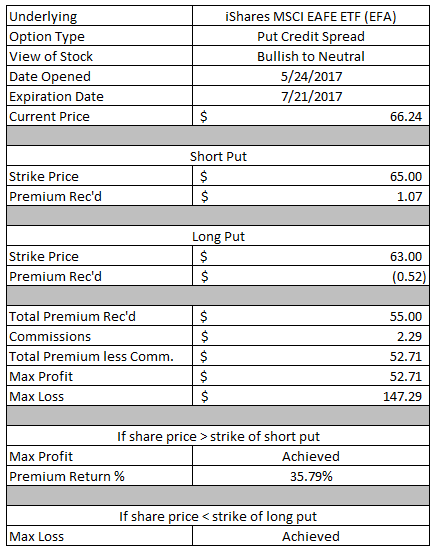 I purchased 100 shares of Qualcomm for $58.49 per share and sold the June 2017 $58.50 call option while bringing in $84.95 in option premium. If Qualcomm is trading above $58.50 at expiration then I'll have to sell my 100 shares at an effective sale price of $59.35. That would be a solid 1.47% return in about 3 weeks' time or 27% on an annualized basis. Since I purchased the shares prior to the ex-div date I'm also entitled to the next dividend payment of $0.57 per share. If Qualcomm is trading below $58.50 at expiration then I'll get to keep my shares and use the option premium to reduce the cost basis on the position. My adjusted cost basis would be reduced down to $57.64. 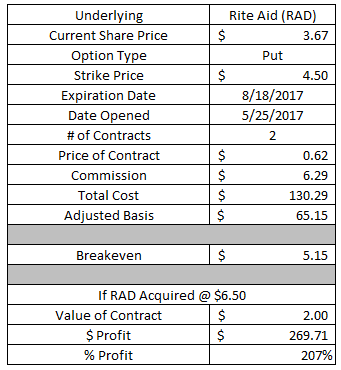 The option premium would be a 1.45% return based on the $58.50 strike price. While I prefer to be a seller of options I will take a few small bets on the long side if they look attractive. The Rite Aid and Walgreens (WBA) merger/acquisition has been dragging on for over a year now with no official approval or denial from the FTC. Well, both parties filed paperwork saying they've complied with all of the previous requests from the FTC and want an answer within the next 90 days. The decision is expected to be made by the end of July and I'm banking on it coming back as approved or at least not denied. If the M&A is allowed to go through then the most likely scenario is that WBA will pay RAD shareholders $6.50 per share which is the lower end of the updated M&A agreement between the 2 companies. 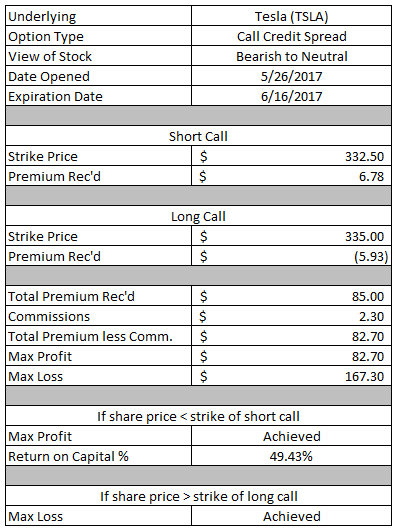 I bought 2 $4.50 call options expiring in the August 2017 expiration cycle. Combined the 2 contracts cost me $130.29. If the M&A is approved at the $6.50 per share price then the value of each contract would be worth $2.00, $6.50 acquisition price less the $4.50 strike price. As of now I plan on purchasing a few more contracts if I find something that's attractive. This deviates from my normal option strategy; however, I think it's a small calculated bet that's worth taking. This put option started out as an attempt to capture some quick premium, but didn't quite go as planned. I've since rolled the position out in time 3 times now collecting additional option premium along they and giving myself more time for the contract work out. 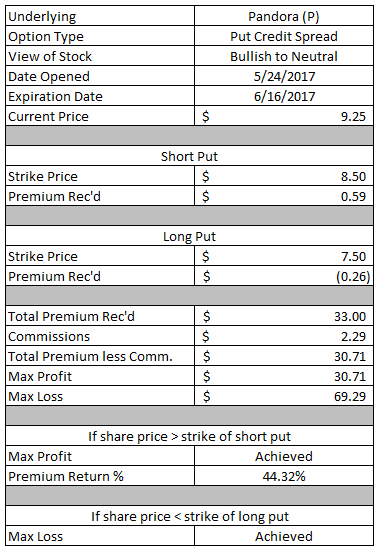 I was able to pick up an additional $0.49 per share in option premium by rolling this position out into the the July expiration cycle. I would have preferred to go out to the June cycle, but there just wasn't enough credit to make it worthwhile. This brings my total credits on this position up to $2.60 per share. The original breakeven on this put option was $35.74, but the additional option premium received from rolling out in time has moved it down to $33.40. That's an improvement of 6.5%. 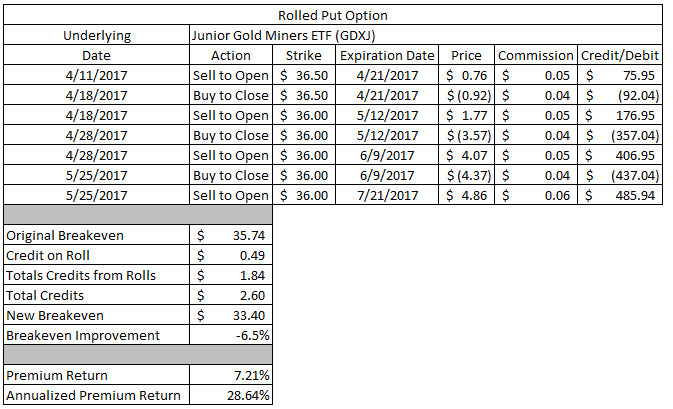 If GDXJ is trading above $36 at expiration then the contract will be OTM and I would be able to keep the full option premium as profit. The $2.60 of credits would represent a 7.21% return on the $3,600 of capital securing the contract and would be an annualized return of 28.6%. This was originally part of a covered strangle that I put on against my shares of CVS, but since then the share price has dropped below the strike of the put side. So I decided to roll the contract out in time to collect more premium. 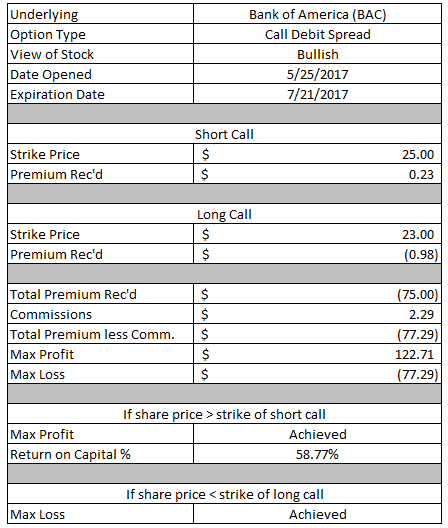 I was able to collect an additional $0.31 per share in option premium by giving myself another 2 weeks for it to play out. This brings my total credits on this put option up to $1.13 per share. The original breakeven for this put option was $77.18 and with the additional credits it's been reduced to $76.87. If CVS' share price is above $78 at expiration then the contract would be OTM and I would keep the full premium received as profit. 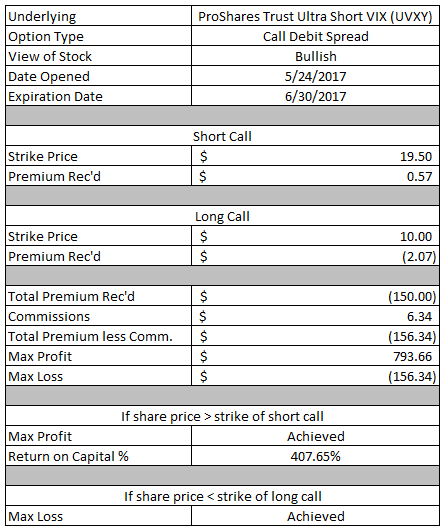 The $112.86 in option premium was be a 1.45% return on the $7,800 of capital securing the position. The annualized return from the date the position was opened until the expiration of the rolled contract would be 10.8%. When I decided to roll this spread out in time this position had been giving me some trouble for the previous few weeks. In hindsight if I would have done nothing the spread would have expired this past Friday at max profit, but I rolled it earlier in the week prior to gold making its move higher. 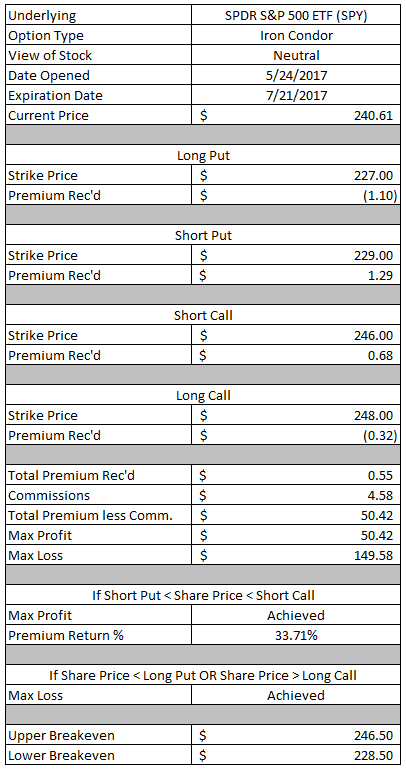 I was able to collect an additional $20.42 in option premium by extending the duration the trade by 3 weeks. That brings the total credits received up to $70.13 and reduces the capital at risk on the position from $150.29 to $129.87. 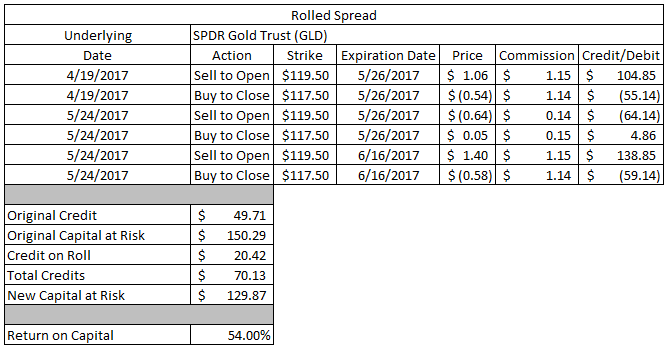 If GLD is trading above $119.50 at expiration then both contracts would be OTM and I would keep the full option premium as profit. That would be a solid 54% return on the capital at risk. My target for closing this position is 50% of the initial credit received. 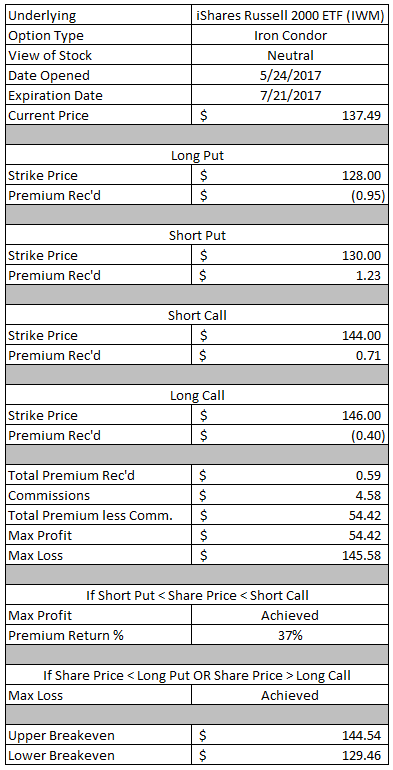 Thus far May has been quite a profitable month for options trading. Through the first 3 trading weeks of May I've generated net profits of $1,699.69. Year to date my net profits are $7,838.23.